You can use the MaxLength property of a TextBox to indicate the maximum number of characters that a user is allowed to enter. 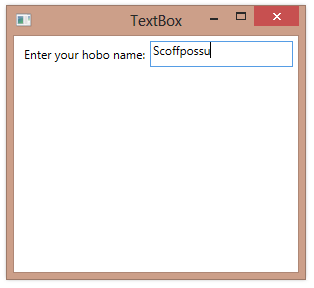 In the example below, we limit the hobo name to a max of 10 characters. The MaxLength also applies to text that you paste into the TextBox. The pasted text will be clipped based on the current value of MaxLength. By default, MaxLength has a value of 0, which indicates that there is no effective maximum length for text entered or pasted into the control. (If a user continued entering text indefinitely, the application would eventually run out of memory).